The below is only a small sample of the type of procedures performed by Dr. Nadjibi everyday in his office. For a comprehensive smile analysis of your smile or to see more before & after pictures, just give Marin Dentistry a call. This patient had worn his upper teeth from years of grinding (bruxism). Dr. Nadjibi restored his teeth back to their natural shape and length with ten porcelain veneers on his upper teeth. This patient had a bike accident as a young boy. His front teeth were badly broken and needed root canals and crowns. Now, years later, his teeth had to be extracted. Dr. Nadjibi extracted his front teeth and placed implants and all porcelain crowns. This patient had obvious spacing problems that could have been corrected with braces, but the patient did not want braces. The teeth were restored with porcelain veneers and all ceramic crowns to improve the appearance. This young doctor had yellow teeth and obvious wear of his front teeth. After whitening procedures, Dr. Nadjibi placed four porcelain veneers on his front teeth to restore them to their natural state. 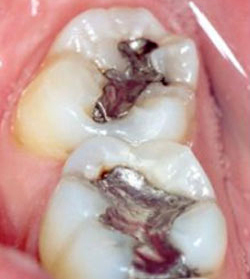 This patient had silver fillings on his molars that had probably been there for more than 10 years. They had re-decayed at the edges of the fillings. 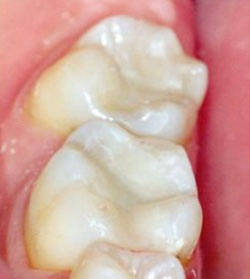 Dr. Nadjibi replaced the fillings with bonded composite fillings.